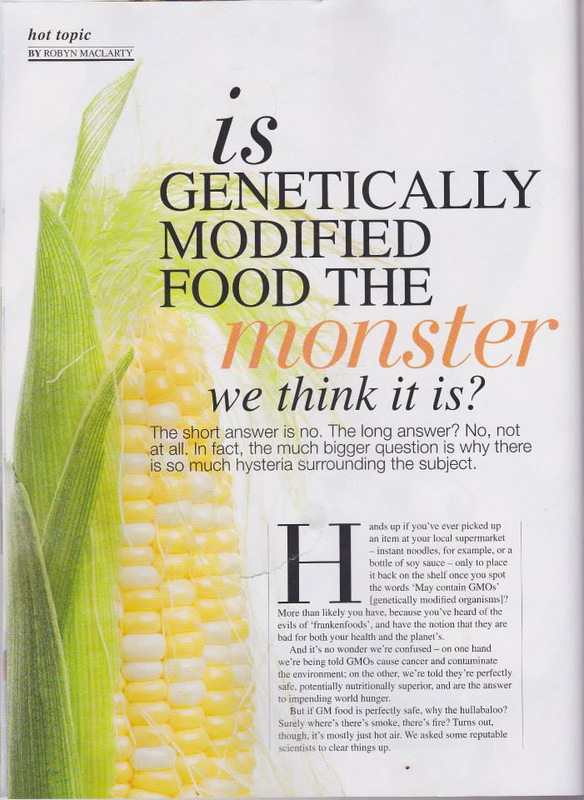 GMOs: poisons that will kill our children, or harmless foods? I DON’T BELIEVE ANY OF THE GMOs CURRENTLY BEING FARMED WORLDWIDE POSE ANY THREAT TO HUMANS OR STOCK ANIMALS AT ALL. NONE! NOR DO MOST BIOLOGICAL SCIENTISTS WHO ACTUALLY UNDERSTAND WHAT GENETIC MANIPULATION OF PLANTS ENTAILS. Is that clear enough? No ambiguity there? Good! Because the people who have taken poor Fair Lady magazine to task recently, mainly on their Facebook page, for daring to publish an article saying the same thing, would have you believe otherwise. By relentless recycling of discredited animal feeding studies, reiteration of untruths, canards and plain lies, and by personal attacks on anyone expressing an alternate view. All three of these straw men are, of course, rich in taurine excreta. In the first place, while Monsanto may well have started the ball rolling on a big scale, and owns patents and seed rights on much of the early and simple one-trait GMOs, they do NOT own everything, and are NOT responsible for many of the recent developments still coming down the developmental pipeline – which are considerably more sophisticated than the ubiquitous herbicide-resistant or Bt-producing maize or cotton. These would include plants resistant to various viruses, bacteria and fungi, plants engineered for higher nutrient / vitamin content (eg: Golden Rice and golden bananas), and drought- and salt-tolerant plants. “Spores and crystalline insecticidal proteins produced by B. thuringiensis have been used to control insect pests since the 1920s and are often applied as liquid sprays”. “Because of their specificity, these pesticides are regarded as environmentally friendly, with little or no effect on humans, wildlife, pollinators, and most other beneficial insects and are used in Organic farming“. Now I will remind everyone that this is an agency which is NOT in Monsanto’s pocket – or anyone else’s – and which upholds high standards in safeguarding the general public. As do the US Department of Agriculture (USDA) and the Food & Drug Administration of the USA, which also have no problems with GMOs (FDA statement; USDA information). Here is a another comprehensive refutation of the “evidence of toxicity” of glyphosate-resistant soybeans, an unpublished study that is widely quoted by anti-GM lobby. I don’t think I need to belabour the point further: I am hopelessly compromised, in the eyes of some of the more rabid activists, by being a biotechnologist at all, and especially – Gasp!! – BECAUSE MY LAB MAKES GMOs!!! However, if that makes me more amenable to believe actual evidence-based findings, rather than unsubstantiated media hype, then so be it. This entry was posted on 29 October, 2013 at 12:10 and is filed under biotechnology. You can follow any responses to this entry through the RSS 2.0 feed. You can leave a response, or trackback from your own site. Excellent analysis, Ed! We need more rational people to be vocal and speak out against all the woo and disinformation being pedaled as science. Thank you! Great post! It seems many people who are against GMOs believe GMOs are part of this vast conspiracy to give all of us cancer, or something like that. And that Golden Rice is the most evil thing ever invented, after nuclear weapons. Great article Ed! Coming from you I will consider that a verifiable source, and consider myself educated on the topic. Thank you. Keep up the great work. Great ED. Hope kenya is listening.